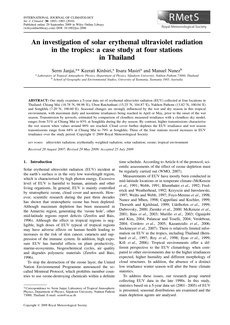 Our study examines a 5-year data set of erythemal ultraviolet radiation (EUV) collected at four locations in Thailand: Chiang Mai (18.78 癗, 98.98 癊), Ubon Ratchathani (15.25 癗, 104.87 癊), Nakhon Pathom (13.82 癗, 100.04 癊) and Songkhla (7.20 癗, 100.60 癊). Seasonal changes are strongly influenced by the wet and dry season in this tropical environment, with maximum daily and noontime irradiances being reached in April or May, prior to the onset of the wet season. Transmission by aerosols, estimated by comparison of cloudless measured irradiance with a cloudless sky model, ranges from 51% at Chiang Mai to 83% at Songkhla during the dry season. By contrast, higher transmissions characterise the wet season when values around 90% are reached. Cloud cover further depletes the EUV irradiance and wet season transmissions range from 68% at Chiang Mai to 79% at Songkhla. Three of the four stations record increases in EUV irradiance over the study period.